Indeed, Mr. Lopez and other senior Assembly Democrats are already paving the way for a kind of bargain, which could include extending an expired tax break, known as 421-A, avidly sought by New York real estate developers. The proposed linking of the two issues in the Assembly was first reported on Sunday in The Daily News. The position taken by Mr. Silver and other Assembly leaders is significant, because the Assembly has in recent years been the place in Albany where proposals to cap property taxes meet a quiet death. 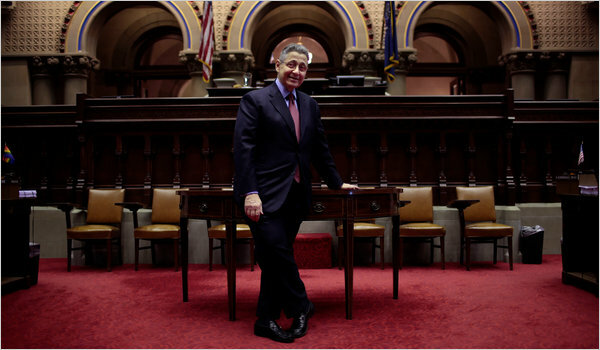 His Democratic caucus is dominated by New York City lawmakers whose constituents often do not own homes, and Mr. Silver is tightly allied with public employees’ unions worried over the cuts to local government spending that caps would require. The Assembly is also a bastion of support for expanded rent regulations and has passed a package of such legislation several times in recent years — proposals that have gone nowhere in the Senate, even during the last two years, when it was controlled by Democrats. Mr. Lopez said his committee was moving fast on an ambitious package of rent legislation, including a bill to abolish vacancy decontrol, a procedure that has allowed owners of rent-regulated apartments to move hundreds of thousands of units out of the rent-stabilization system, according to estimates by tenant advocates. He also said he hoped to pass a temporary extension of the tax break that would expire on the same day in June as the existing rent regulations. “Those three issues have to be looked at and somehow thought of in an interrelated way,” Mr. Lopez said. Mr. Silver said he would like not only to preserve those protections, but also to expand them, by raising the income and rent thresholds. One model could be a bill that has passed the Assembly twice in recent years: It would raise the thresholds for so-called high-income decontrol to $2,700 in monthly rent and $240,000 in annual income. Mr. Cuomo has so far avoided taking a clear stand on the issue. The governor’s 273-page “Urban Agenda” extensively discussed affordable housing but did not mention rent regulation, effectively New York’s largest program of housing subsidies. But the notion of a three-issue deal was quickly criticized by real estate leaders, who argued that property-tax caps and rent regulation should be considered separately. Scott Reif, a spokesman for the Senate majority leader, Dean G. Skelos of Long Island, declined to comment on the Assembly’s proposed rent regulation package, though Republicans have tended to oppose such measures. But he joined Mr. Spinola in arguing that a property tax cap should in no way be linked to rent regulation. Much could turn on whether Assembly Democrats are able to split apart the real estate lobby, one of the most powerful and well financed in New York. While the city’s large real estate developers, represented by Mr. Spinola, have generally worked closely in Albany with owners of rent-regulated apartments, they may put a higher priority on continuing the 421-A tax break than on paring back rent regulations.